Next review Empire Today lied 3 times about missing appt. Jul 03, 2013 Steven, your experience is not what we expect for our customers, and we regret that you were inconvenienced. It’s our understanding that we’ve been in contact with you and that your sales appointment has been rescheduled. You can also contact us at 888-588-2315 x4195 or customersupport@empiretoday.com if you have any additional questions or concerns. 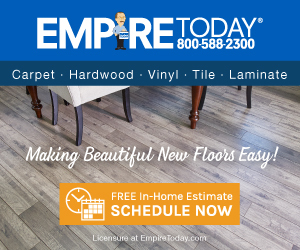 I scheduled an appointment with empire to quote new flooring in my home. I had an appointment today, Monday, between 4-6. I leave work early (losing money)to ensure I am home on time for the representative. I wait until 6:30 before I call customer service. The customer service rep puts me on hold for 15 minutes while he tries to contact the rep that never made it to my home. He comes back to tell me that the rep didn't have the flooring samples and she called her sales manager and told him and assumed that the sales manager would call and cancel my appointment. The sales manager assumed the rep would cancel my appointment (probably because that's what a good rep would do, not have her boss do her work), so nobody ended up calling me. The customer service offered $50 off. Wow...$50 off of my project which would have been about $20k. I lost more than $50 for leaving work early. Not notifying your clients is bad business. Review #358911 is a subjective opinion of onlyonegould.